to start his account with the founding of Roman by Romulus, and then working methodically through the stages of Roman development to the period AD60-70. This was a time of turmoil and the period in which Petellius survived and prospered. It was the time of the great revolt in Britain that came close to driving Romans from the islands. DESCRIPTION: The first reader reaction might be “Petellius who?” Ancient Rome was a military society growing out of the city state of Rome. For all that has been written about Rome, accounts tend to be biased because they were written by one faction or another during the interminable civil wars and political wrangling that characterized much of Roman history. Considering how much effort was expended on warfare and internal conflicts, it is amazing that the Romans found time to leave such a legacy of architecture and literature. As schools attempt to add more recent history to the subject, Ancient History suffers and in some countries history has been largely removed from the curriculum as a difficult subject that requires students to do some work. This is unfortunate because we see our future in our past and the student who can remember the key dates of history is likely to also remember why they were important and to understand the lessons of history for the future. The author has therefore been wise to start his account with the founding of Roman by Romulus, and then working methodically through the stages of Roman development to the period AD60-70. This was a time of turmoil and the period in which Petellius survived and prospered. It was the time of the great revolt in Britain that came close to driving Romans from the islands. It was the time when civil wars ripped Roman society and encouraged revolts across Europe and to the East. Roman Generals were key to Roman development because, reluctantly or deliberately, they provided the Emperors and determined how long an Emperor survived. Petellius was the son in law of Vespasian and his fortunes rose and fell and rose again with the fortunes of Vespasian. Petellius was a lucky commander, leading a colourful life and present at many of the critical points in the fortunes of Rome during this narrow period of its history. 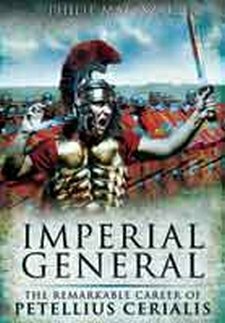 The author provides a fascinating insight into the society and military structure, alongside the account of Petellius who proved to be a successful diplomat as much as a successful commander. He was also a born survivor who knew when to keep his head down during the periods when Vespasian was not able to offer patronage. A biography that is well worth reading.